Curtain or curtainsframing the window opening, give any room a neat and tidy appearance. Choosing a particular model of curtains – for example, wide loops, swags or special holders you can create interiors in different styles. 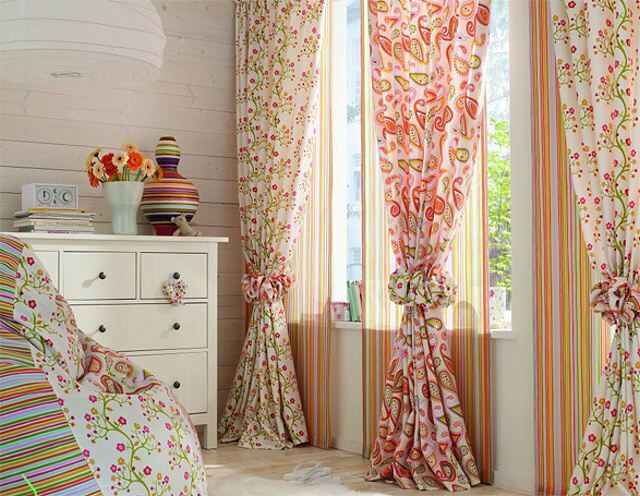 Great importance has the choice of curtain fabric, suitable for each specific case. Curtains can be lined in a contrasting color. The simple curtains you can sew yourself, spending quite a bit of time. - 2 holder for cord. Choose your interior style of window curtains. Try to start to sew curtains simple model, without the lining and additional decorative elements. Decide what length they should be, how deep they will crease and will they actually. Measure with a tape the distance from the cornice to the floor or to the windowsill (if you decided to do a shortened curtains). From this value, subtract 1 cm and get the height of the curtains. Also measure the width of the ledge is the same width will have the curtains ready-made from laid folds. Depending on how deep you want the pleats to increase the measured width of the cornice 1.5-2.5 times. If your curtains will consist of two sliding halves, then divide the resulting value by two to get the width of each curtains. Lay the fabric on a large table or the floor and cutting it: measure the line width of the weft (plus allowances for processing lateral slices of 3 cm on both sides), and on foundations – the height of the curtains (plus allowances on the hem – 10 cm below and 4 cm from the top). If the width of the purchased fabric is not enough to cut single cut the curtains, then cut it out of several panels. In this case, can not buy fabric with a large pattern. If you chose a pattern with a narrow width fabric, you will need to buy more material to have enough to match the pattern at the joints of panels each curtain. Stitch the cloth curtains, if necessary in your case. Fold them, right sides and sew a lapped seam (see link) that allows you to hide the cuts inside the seam. Fold the side sections (or edges) to the wrong side first at 1 cm, then 2 cm Prostrochite curtains along these bends, retreating 1.9 cm from the edge. The bottom of the curtains, fold two times, at 2.5 cm and 7.5 cm, and fix the bent stock. Route engine line along the fold. To the corners of the curtains looked more carefully, you can make them "envelope". To this end, the hem of the side sections to not leave the bottom hemmed sections with a length of approximately 20 cm and to deploy in these places the hem. Fold the bottom of the curtains twice as described above and smooth the crease. On the side mark the point at the level of intersection with the fold line of the bottom seam allowance (7.5 cm). Expand the bottom seam allowance and fold the side allowances. At the lower cut curtains mark the point on the level crossing it with either side of the seam allowance (2 cm). Two plotting points connect the diagonal line and prostrochite it. Cut the excess fabric, Ratatouille allowances and turn the corner. Similarly treat the remaining corners at the bottom of the curtains and priutyuzhte them. Finish stitching the side and prostrochite foot rails of the bottom hem of the curtains. Top fold of the curtains on the 3 cm and priutyuzhte bend. On the reverse side of curtain attach the braid, stepping back 1 cm from the fold, and pin it with pins top and bottom. The length of the tape equal to the width of the curtains plus allowances by 2.5 cm on both sides. Pull one side of the curtain tape (from the inside) the ends of the cords and tie them tightly. Tuck the seam allowance of the ribbon inside. Do the same with the other side of the curtains, but not tie the laces, curtain lace – the edge of the curtain will be located on the outer edge of the window. Pristrochite tape to the curtain, paving the lines along the bottom and top edges of the curtain tapes in the same direction. Sew the short bent edge of the braid, not sewing up the seam loose laces on the outside of the curtains. Pull the curtains, the cords of the braid to the desired size, forming uniform pleats. Tie off the cords. Insert the loop of curtain tape hooks for curtains at a distance of 10 cm from each other. Choose a fabric that goes well with the color of the room, which will hang curtains. For the bedroom choose a more dense and dark fabrics, for children's optimal natural fabrics with a light, cheerful pattern, the kitchen will become a cozy look with curtains of plaid or patterned on a fruit and vegetable theme. Country variant – linen curtains in natural color with jacquard weave or a pattern simulating traditional embroidery.